Nobel laureate Samuel Beckett’s two-act play ‘Happy Days’ (Oh les beaux jours) was staged on February 01, 2019 at Experimental Theatre Hall, BSA. The monodrama was acted by Jyoti Sinha and directed by Shuvashis Sinha. In the play, a woman, literally sinking continually deeper into the ground, continues to prattle about the trivialities of life. In other words, perhaps, as one gets nearer and nearer to death, one still pretends that life will go on normally forever. This production tries to enact the characteristic Beckettian daring that brings forth a modern theatrical spectacle of an individual’s determination and capacity to mobilize her inner self to survive. It is mentionable here that Beckett was considered as one of the most influential playwrights of 20th century for his minimalist and bleak writings about alienation and death. He was one of the founders of the Theatre of the Absurd, and a favorite of academic and avant-garde intellectuals alike. He represents the endless repetition of dying moments rather than death itself. His characters wish to finish life but the end never comes because the clock becomes slower and slower. There is still time, always. 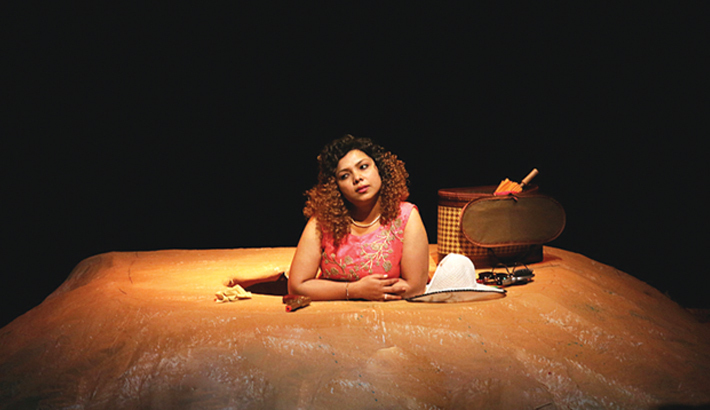 The play was translated by Kabir Chowdhury and Shahin Kabir, and adapted and edited jointly by Shuvashis Sinha and Jyoti Sinha, while light, music and set were designed by Shuvashis Sinha. The performance was appreciated by the audience.